Whatever the season, golf is a year-round sport across the bounty of Greater Palm Springs. For both desert guests and locals alike, the valley&apos;s 120 courses present countless options for casual play, tournaments, instruction, member options, spectating and junior golf. For valley visitors seeking ways to enjoy the desert&apos;s fairways with the whole family and desert regulars aiming to get kids involved in golf -- opportunities abound for all levels of junior player. If you&apos;re seeking options to get your kids on-course, or just searching for a few ways to spend some family time with club in hand, here are some recommended choices to get your whole crew swinging together. It&apos;s tough to beat free golf. But at both Marriott&apos;s Shadow Ridge Golf Club and the JW Marriott Desert Springs in Palm Desert, that&apos;s just what you&apos;ll find. After 3:00 p.m. at both properties, folks will find a 365-day-a-year opportunity for kids 15-years-old and younger to play for free when accompanied by a full paying adult; the program also provides gratis rental clubs for the junior player. At Shadow Ridge, the same opportunity extends to instruction at the lauded Marriott Golf Academy, where kids 15-and-younger enjoy a free lesson when accompanied by a full-paying adult. At the JW, those just looking to knock it around with the brood will enjoy the 18-hole, full grass putting course on-site. And a full slate of par 3 and shorter course choices across the desert also present a great way to either introduce kids to the game, or enjoy a golf day as a family on a track which won&apos;t overpower the little ones. The Lights at Indio is reputed as one of the longest par 3 courses in the nation, and proves a flexible golf opportunity as the valley&apos;s only courses lit for evening play. For stouter par 3 routing, the North Course at Shadow Hills Golf Club in Indio provides a fun test for all players, with holes ranging from 135 to 210 yards, and a host of water features along the way. Want more water? Then enjoy a day at the walking-only Palm Royale Country Club in Palm Desert, where a family stroll plays across the well-conditioned Ted Robinson design with a continual card of hazards and bunker tests. In Palm Springs, the Pebble Course at Cimarron Golf Resort provides a great tune-up to its championship Boulder Course, and offers a unique, wide-open links-style terrain to spread the ball a bit. Families looking for a desert day trip should put the clubs in the trunk for a round at Hawk&apos;s Landing in Yucca Valley, where the cooler environs offer a 12-hole loop design, presenting the fun and flexible option to play six, 12 or 18 holes. For families seeking to get kids a golf/life skills introduction to the game, The First Tee of the Coachella Valley in Palm Desert offers a full program schedule, coupled with an on-site driving range and 9-hole par-3 course. 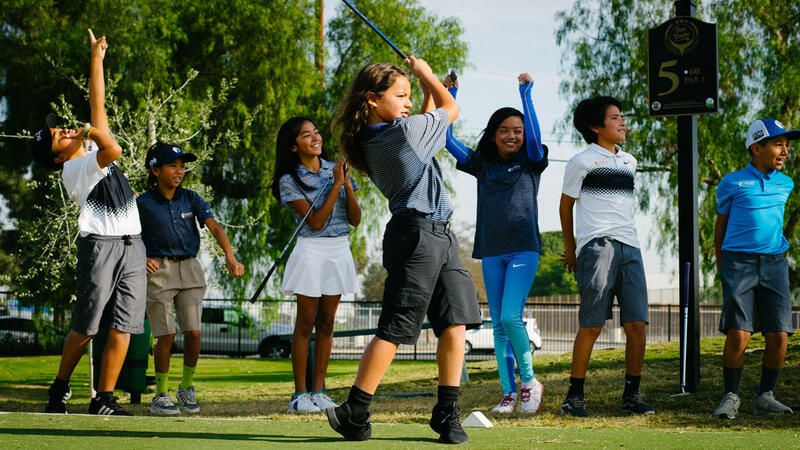 Reaching deeper to help grow the game in the past decade, the PGA of America has introduced and evolved a number of youth-based programs. For summertime instruction, the PGA Jr. Camp at Mission Hills Country Club offers three different five-day camps, which present a 6-to-1 student-to-teacher ratio across three morning hours of instruction for kids aged 7-13. Those aiming to get involved in introductory competitive play should look into the burgeoning PGA Jr. League teams, where six desert sites (including Desert Willow Golf Resort) host boys and girls play in a fun, team-oriented format. The region&apos;s leading amateur golf association doesn&apos;t forget its future. At SCGA Junior, annual club members enjoy golf rates of a mere $1-$5 at participating course and driving range facilities, with Greater Palm Springs&apos; participating courses including Desert Falls CC, Indian Canyons Golf Resort, Shadow Mountain Golf Club and SilverRock Resort. Junior golfers and families seeking a fun and casual way to spend an hour with a golf ball need not worry about the game&apos;s formalities. At the College Golf Center in Palm Desert (among the SCGA Junior participating facilities), a shorts, t-shirt and flip flops approach is just fine at the popular, public facility, where a small bucket goes for $5 and nighttime ball-striking is alight until 10:00 p.m., Monday thru Friday (with last balls sold at 9:00 p.m.). For players getting the golf bug, note that the Center also is home to a number of private instructors who specialize in the kids&apos; game. In Cathedral City, spread out a day of kids and family fun at Boomers, where a round of mini golf is matched with video games, Go Karts and Bumper Boats. 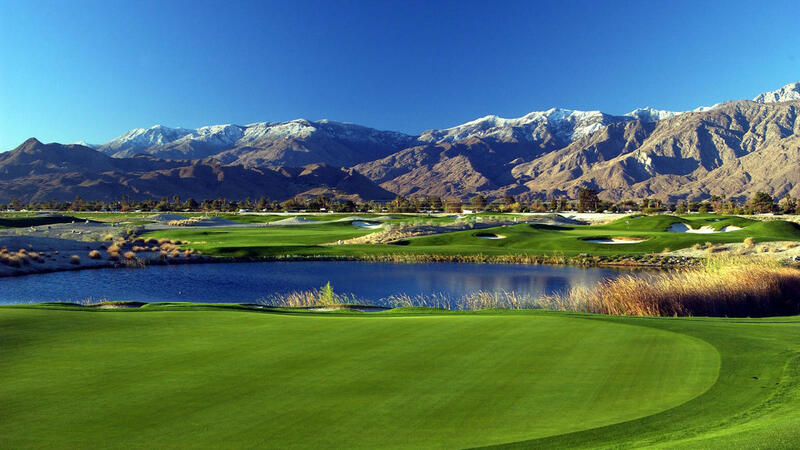 For more, check out our page on golfing in Greater Palm Springs. Judd Spicer serves as the Co-Host of “The Press Box” radio show, weekdays from 4-5 PM (PST) on ESPN 103.9 FM (Palm Springs, California). He is a two-time award-winning, veteran freelance writer and Associate Member of the Golf Writers Association of America. After 12 years of covering MLB, NBA, NCAA and the active golf landscape of the Twin Cities, he relocated to the Palm Springs region in 2011 to further pursue his writing endeavors, golf game and Champions Tour dream. He contributes to a host of national, regional and local outlets, with wide-ranging print and online clients such as the SCGA’s FORE Magazineand plusFORE digital mag, The Golf Channel.com, Palm Springs Life and the Desert Publications, Inc. family of magazines, the Greater Palm Springs Conventions Bureau, and The Desert Sun newspaper, for which he also pens a regular column. To read Judd’s work, please visit his professional writing website.